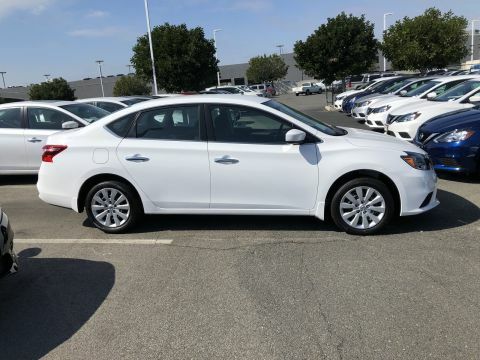 Fresh Powder 2019 Nissan Sentra S FWD CVT 1.8L 4-Cylinder CVT, Charcoal Cloth, ABS brakes, Air Conditioning, Carpeted Floor Mats w/Trunk Mat, Dual front impact airbags, Dual front side impact airbags, Front anti-roll bar, Front reading lights, Front wheel independent suspension, Low tire pressure warning, Occupant sensing airbag, Overhead airbag, Rear anti-roll bar.Recent Arrival! 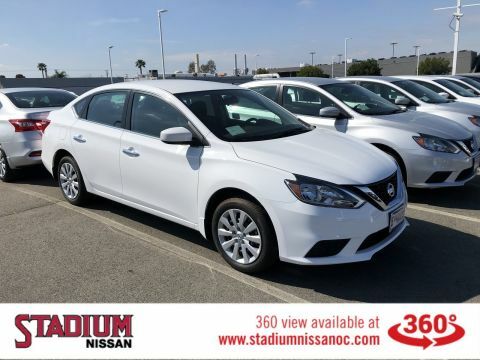 Fresh Powder 2019 Nissan Sentra S FWD CVT 1.8L 4-Cylinder CVT, Charcoal Cloth, ABS brakes, Dual front impact airbags, Dual front side impact airbags, Front anti-roll bar, Front wheel independent suspension, Fully automatic headlights, Low tire pressure warning, Passenger vanity mirror, Power steering, Power windows, Radio data system, Remote keyless entry, Speed control, Steering wheel mounted audio controls, Variably intermittent wipers.Recent Arrival! 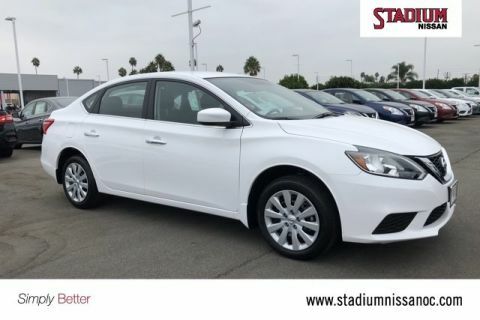 Fresh Powder 2019 Nissan Sentra S FWD CVT 1.8L 4-Cylinder CVT, Charcoal Cloth, ABS brakes, Air Conditioning, Body Colored Splash Guards (4 Pieces), Brake assist, Cloth Seat Trim, Delay-off headlights, Driver vanity mirror, Electronic Stability Control, Exterior Parking Camera Rear, Front anti-roll bar, Front wheel independent suspension, Low tire pressure warning, Outside temperature display, Power steering, Radio data system, Radio: AM/FM/Aux-In Audio System, Rear anti-roll bar, Speed-sensing steering, Traction control.Recent Arrival! New Price! 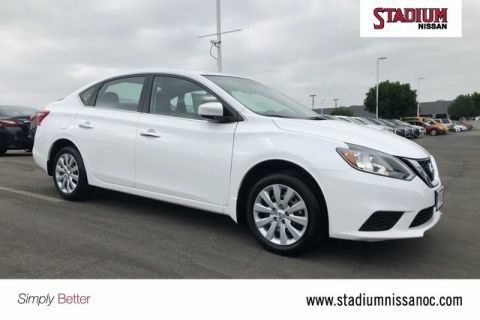 Fresh Powder 2019 Nissan Sentra S FWD CVT 1.8L 4-Cylinder CVT, Charcoal Cloth, 4 Speakers, 6-Way Adjustable Driver's Seat, ABS brakes, Air Conditioning, AM/FM radio, Body Colored Splash Guards (4 Pieces), Brake assist, Cloth Seat Trim, Delay-off headlights, Driver door bin, Dual front impact airbags, Dual front side impact airbags, Electronic Stability Control, Exterior Parking Camera Rear, Front anti-roll bar, Front wheel independent suspension, Fully automatic headlights, Low tire pressure warning, Occupant sensing airbag, Overhead airbag, Panic alarm, Passenger door bin, Passenger vanity mirror, Power door mirrors, Power steering, Power windows, Radio data system, Radio: AM/FM/Aux-In Audio System, Rear anti-roll bar, Rear window defroster, Remote keyless entry, Speed control, Speed-sensing steering, Split folding rear seat, Steering wheel mounted audio controls, Tachometer, Telescoping steering wheel, Tilt steering wheel, Traction control, Trip computer.Recent Arrival! New Price! 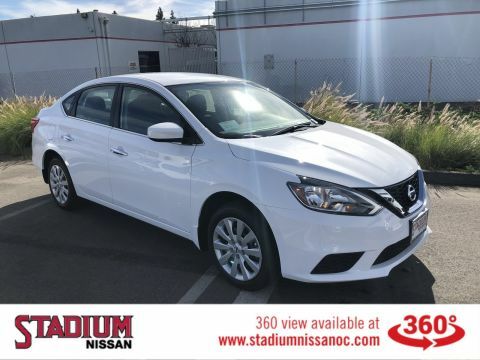 Fresh Powder 2019 Nissan Sentra S FWD CVT with Xtronic 1.8L 4-Cylinder DOHC 16V CVT with Xtronic, charcoal Cloth, 4 Speakers, 6-Way Adjustable Driver's Seat, ABS brakes, AM/FM radio, Brake assist, CD player, Dual front impact airbags, Dual front side impact airbags, Electronic Stability Control, Front anti-roll bar, Front Bucket Seats, Front Center Armrest, Front wheel independent suspension, Fully automatic headlights, Low tire pressure warning, Occupant sensing airbag, Overhead airbag, Radio data system, Radio: AM/FM/Aux-In Audio System, Rear anti-roll bar, Split folding rear seat, Tachometer, Telescoping steering wheel, Tilt steering wheel, Trip computer, Variably intermittent wipers.Recent Arrival! 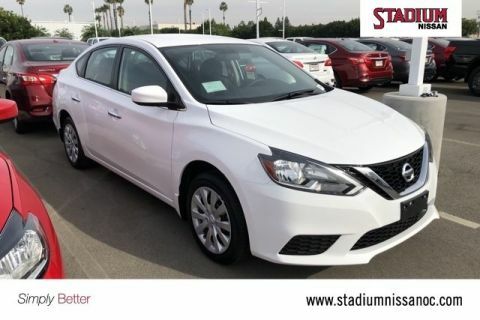 Fresh Powder 2019 Nissan Sentra S FWD CVT 1.8L 4-Cylinder CVT, Charcoal Cloth, 16 Steel Wheels w/Full Wheel Covers, 4 Speakers, 6-Way Adjustable Driver's Seat, ABS brakes, Air Conditioning, AM/FM radio, Body Colored Splash Guards (4 Pieces), Brake assist, Bumpers: body-color, Carpeted Floor Mats w/Trunk Mat, Cloth Seat Trim, Delay-off headlights, Driver door bin, Driver vanity mirror, Dual front impact airbags, Dual front side impact airbags, Electronic Stability Control, Exterior Parking Camera Rear, Front anti-roll bar, Front Bucket Seats, Front Center Armrest, Front reading lights, Front wheel independent suspension, Fully automatic headlights, Illuminated entry, Low tire pressure warning, Occupant sensing airbag, Outside temperature display, Overhead airbag, Overhead console, Panic alarm, Passenger door bin, Passenger vanity mirror, Power door mirrors, Power steering, Power windows, Radio data system, Radio: AM/FM/Aux-In Audio System, Rear anti-roll bar, Rear USB Ports, Rear window defroster, Remote keyless entry, Speed control, Speed-sensing steering, Split folding rear seat, Steering wheel mounted audio controls, Tachometer, Telescoping steering wheel, Tilt steering wheel, Traction control, Trip computer, Variably intermittent wipers.Recent Arrival! 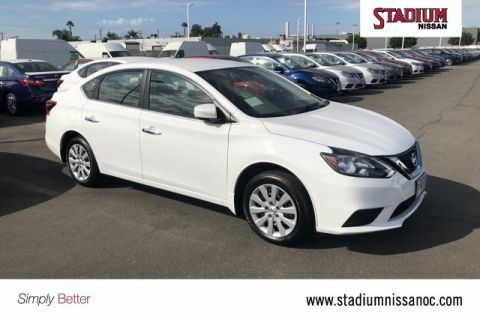 Brilliant Silver Metallic 2019 Nissan Sentra S FWD CVT 1.8L 4-Cylinder CVT, Charcoal Cloth, 16 Steel Wheels w/Full Wheel Covers, 4 Speakers, 6-Way Adjustable Driver's Seat, ABS brakes, Air Conditioning, AM/FM radio, Body Colored Splash Guards (4 Pieces), Brake assist, Bumpers: body-color, Carpeted Floor Mats w/Trunk Mat, Cloth Seat Trim, Delay-off headlights, Driver door bin, Driver vanity mirror, Dual front impact airbags, Dual front side impact airbags, Electronic Stability Control, Exterior Parking Camera Rear, Front anti-roll bar, Front Bucket Seats, Front Center Armrest, Front reading lights, Front wheel independent suspension, Fully automatic headlights, Illuminated entry, Low tire pressure warning, Occupant sensing airbag, Outside temperature display, Overhead airbag, Overhead console, Panic alarm, Passenger door bin, Passenger vanity mirror, Power door mirrors, Power steering, Power windows, Radio data system, Radio: AM/FM/Aux-In Audio System, Rear anti-roll bar, Rear USB Ports, Rear window defroster, Remote keyless entry, Speed control, Speed-sensing steering, Split folding rear seat, Steering wheel mounted audio controls, Tachometer, Telescoping steering wheel, Tilt steering wheel, Traction control, Trip computer, Variably intermittent wipers.Recent Arrival! 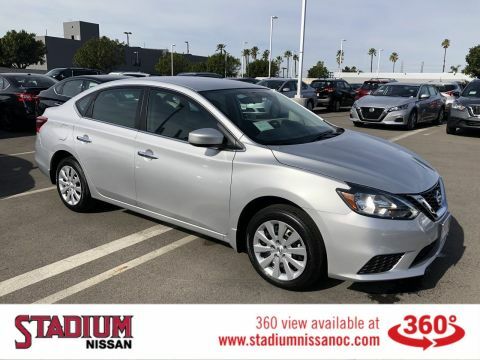 Brilliant Silver Metallic 2019 Nissan Sentra S FWD CVT with Xtronic 1.8L 4-Cylinder DOHC 16V CVT with Xtronic, charcoal Cloth, 16 Steel Wheels w/Full Wheel Covers, 4 Speakers, 6-Way Adjustable Driver's Seat, ABS brakes, Air Conditioning, AM/FM radio, Brake assist, Bumpers: body-color, Cloth Seat Trim, Delay-off headlights, Driver door bin, Driver vanity mirror, Dual front impact airbags, Dual front side impact airbags, Electronic Stability Control, Exterior Parking Camera Rear, Front anti-roll bar, Front Bucket Seats, Front Center Armrest, Front reading lights, Front wheel independent suspension, Fully automatic headlights, Illuminated entry, Low tire pressure warning, Occupant sensing airbag, Outside temperature display, Overhead airbag, Overhead console, Panic alarm, Passenger door bin, Passenger vanity mirror, Power door mirrors, Power windows, Radio data system, Radio: AM/FM/Aux-In Audio System, Rear anti-roll bar, Rear window defroster, Remote keyless entry, Speed control, Speed-sensing steering, Split folding rear seat, Steering wheel mounted audio controls, Tachometer, Telescoping steering wheel, Tilt steering wheel, Traction control, Trip computer, Variably intermittent wipers.Recent Arrival! New Price! 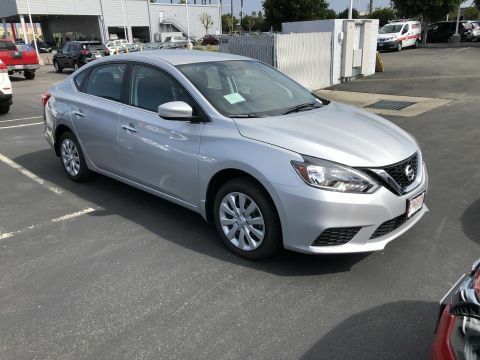 Gun Metallic 2019 Nissan Sentra S FWD CVT 1.8L 4-Cylinder CVT, Charcoal Cloth, 6-Way Adjustable Driver's Seat, ABS brakes, Air Conditioning, AM/FM radio, Brake assist, Cloth Seat Trim, Delay-off headlights, Driver door bin, Dual front impact airbags, Dual front side impact airbags, Electronic Stability Control, Exterior Parking Camera Rear, Front anti-roll bar, Front Bucket Seats, Front Center Armrest, Front wheel independent suspension, Fully automatic headlights, Illuminated entry, Low tire pressure warning, Occupant sensing airbag, Overhead airbag, Overhead console, Panic alarm, Passenger door bin, Power steering, Radio: AM/FM/Aux-In Audio System, Rear anti-roll bar, Rear window defroster, Remote keyless entry, Speed control, Speed-sensing steering, Split folding rear seat, Steering wheel mounted audio controls, Tachometer, Tilt steering wheel, Traction control, Variably intermittent wipers.Recent Arrival! 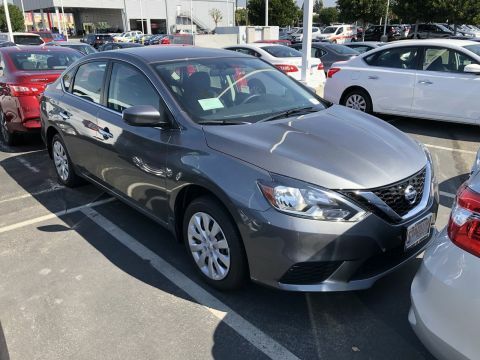 Deep Blue Pearl 2019 Nissan Sentra S FWD CVT 1.8L 4-Cylinder CVT, Charcoal Cloth, 16 Steel Wheels w/Full Wheel Covers, 4 Speakers, 6-Way Adjustable Driver's Seat, ABS brakes, Air Conditioning, AM/FM radio, Body Colored Splash Guards (4 Pieces), Brake assist, Bumpers: body-color, Carpeted Floor Mats w/Trunk Mat, Cloth Seat Trim, Delay-off headlights, Driver door bin, Driver vanity mirror, Dual front impact airbags, Dual front side impact airbags, Electronic Stability Control, Exterior Parking Camera Rear, Front anti-roll bar, Front Bucket Seats, Front Center Armrest, Front reading lights, Front wheel independent suspension, Fully automatic headlights, Illuminated entry, Low tire pressure warning, Occupant sensing airbag, Outside temperature display, Overhead airbag, Overhead console, Panic alarm, Passenger door bin, Passenger vanity mirror, Power door mirrors, Power steering, Power windows, Radio data system, Radio: AM/FM/Aux-In Audio System, Rear anti-roll bar, Rear USB Ports, Rear window defroster, Remote keyless entry, Speed control, Speed-sensing steering, Split folding rear seat, Steering wheel mounted audio controls, Tachometer, Telescoping steering wheel, Tilt steering wheel, Traction control, Trip computer, Variably intermittent wipers.Recent Arrival! New Price! 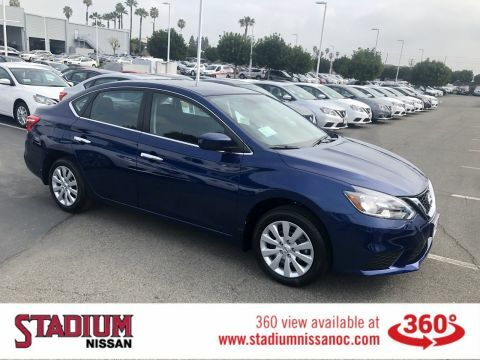 Deep Blue Pearl 2019 Nissan Sentra S FWD CVT with Xtronic 1.8L 4-Cylinder DOHC 16V CVT with Xtronic, charcoal Cloth, 16 Steel Wheels w/Full Wheel Covers, 4 Speakers, 6-Way Adjustable Driver's Seat, ABS brakes, Air Conditioning, AM/FM radio, Brake assist, Bumpers: body-color, Cloth Seat Trim, Delay-off headlights, Driver door bin, Driver vanity mirror, Dual front impact airbags, Dual front side impact airbags, Electronic Stability Control, Exterior Parking Camera Rear, Front anti-roll bar, Front Bucket Seats, Front Center Armrest, Front reading lights, Front wheel independent suspension, Fully automatic headlights, Illuminated entry, Low tire pressure warning, Occupant sensing airbag, Outside temperature display, Overhead airbag, Overhead console, Panic alarm, Passenger door bin, Passenger vanity mirror, Power door mirrors, Power steering, Power windows, Radio data system, Radio: AM/FM/Aux-In Audio System, Rear anti-roll bar, Rear window defroster, Remote keyless entry, Speed control, Speed-sensing steering, Split folding rear seat, Steering wheel mounted audio controls, Tachometer, Telescoping steering wheel, Tilt steering wheel, Traction control, Trip computer, Variably intermittent wipers.Recent Arrival! New Price! 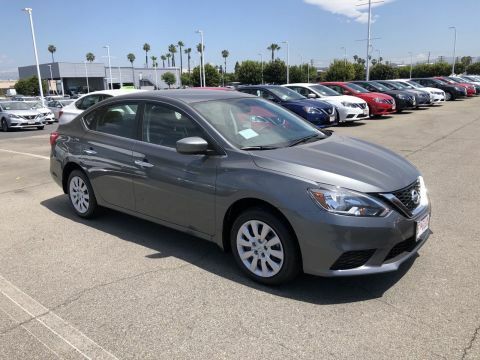 Gun Metallic 2019 Nissan Sentra S FWD CVT 1.8L 4-Cylinder CVT, Charcoal Cloth, 16 Steel Wheels w/Full Wheel Covers, 4 Speakers, 6-Way Adjustable Driver's Seat, ABS brakes, Air Conditioning, AM/FM radio, Body Colored Splash Guards (4 Pieces), Brake assist, Bumpers: body-color, Carpeted Floor Mats w/Trunk Mat, Cloth Seat Trim, Delay-off headlights, Driver door bin, Driver vanity mirror, Dual front impact airbags, Dual front side impact airbags, Electronic Stability Control, Exterior Parking Camera Rear, Front anti-roll bar, Front Bucket Seats, Front Center Armrest, Front reading lights, Front wheel independent suspension, Fully automatic headlights, Illuminated entry, Low tire pressure warning, Occupant sensing airbag, Outside temperature display, Overhead airbag, Overhead console, Panic alarm, Passenger door bin, Passenger vanity mirror, Power door mirrors, Power steering, Power windows, Radio data system, Radio: AM/FM/Aux-In Audio System, Rear anti-roll bar, Rear USB Ports, Rear window defroster, Remote keyless entry, Speed control, Speed-sensing steering, Split folding rear seat, Steering wheel mounted audio controls, Tachometer, Telescoping steering wheel, Tilt steering wheel, Traction control, Trip computer, Variably intermittent wipers.Recent Arrival! New Price! 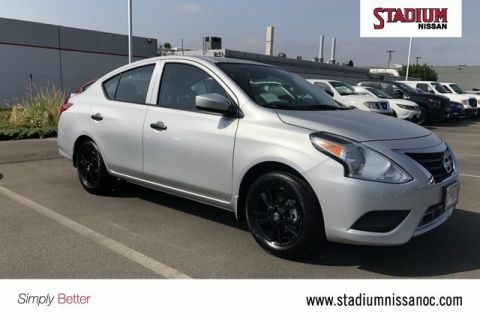 Super Black 2019 Nissan Sentra S FWD CVT 1.8L 4-Cylinder CVT, Charcoal Cloth, 16 Steel Wheels w/Full Wheel Covers, 4 Speakers, 6-Way Adjustable Driver's Seat, ABS brakes, Air Conditioning, AM/FM radio, Body Colored Splash Guards (4 Pieces), Brake assist, Bumpers: body-color, Carpeted Floor Mats w/Trunk Mat, Cloth Seat Trim, Delay-off headlights, Driver door bin, Driver vanity mirror, Dual front impact airbags, Dual front side impact airbags, Electronic Stability Control, Exterior Parking Camera Rear, Front anti-roll bar, Front Bucket Seats, Front Center Armrest, Front reading lights, Front wheel independent suspension, Fully automatic headlights, Illuminated entry, Low tire pressure warning, Occupant sensing airbag, Outside temperature display, Overhead airbag, Overhead console, Panic alarm, Passenger door bin, Passenger vanity mirror, Power door mirrors, Power steering, Power windows, Radio data system, Radio: AM/FM/Aux-In Audio System, Rear anti-roll bar, Rear USB Ports, Rear window defroster, Remote keyless entry, Speed control, Speed-sensing steering, Split folding rear seat, Steering wheel mounted audio controls, Tachometer, Telescoping steering wheel, Tilt steering wheel, Traction control, Trip computer, Variably intermittent wipers.Recent Arrival! 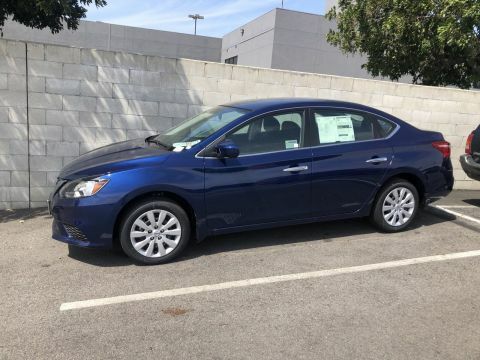 Where can I find vehicle specials? 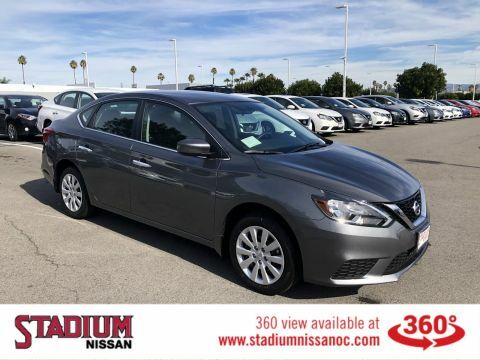 If you are interested in saving on a new or used vehicle, you should check our new vehicle specials and our used vehicle specials page. 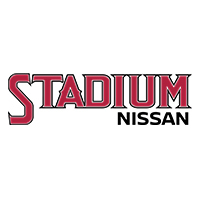 Our offers & incentives page contains the most current information for new Nissan incentives. 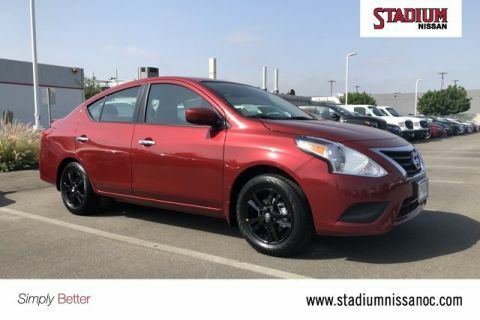 What should I do once I find a new Nissan I want to check out? That’s great to hear! 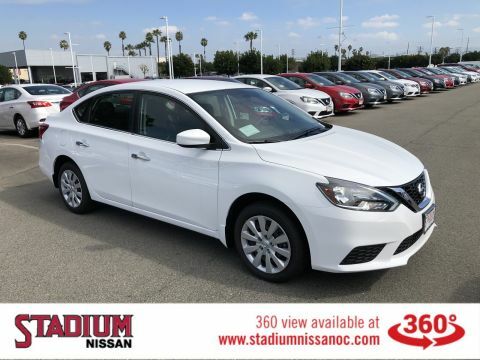 You can call our sales department to schedule a test drive, or you can schedule one through our website. We also recommend using our payment calculator tool to explore monthly payments. 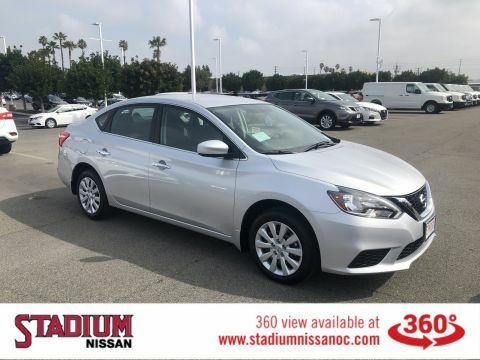 You can also come by to check out our inventory in person. 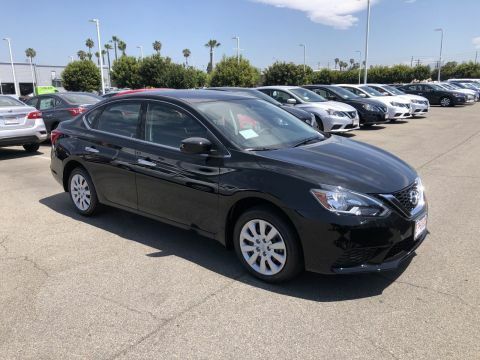 We’re just a quick drive from Los Angeles, Garden Grove, Santa Ana, Buena Park, Long Beach, and Tustin. 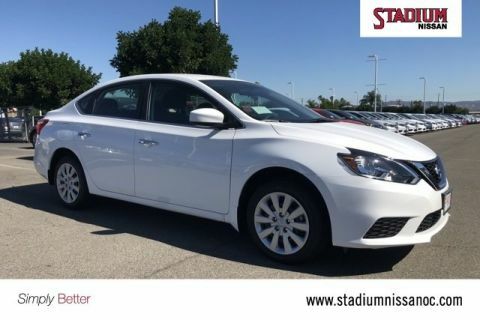 Can I get financing if I have poor credit? Yes! Our finance department has a lot of experience with helping all sorts of customers get financing. If you have bad credit or no credit, we will do our best to help you secure a car loan. Please fill out our credit application today and we’ll reach out to you.